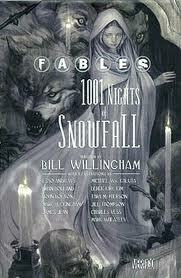 Fables: 1001 Nights of Snowfall is part of the Fables series that I have been reading for a year or so. The difference with this book is that you can read it either as an introduction to the series or you can read it part way through the series. Kelly's guide to the series recommends reading it between volumes 8 and 9 of the Fables books which is exactly where I am reading it. The main concept of this whole volume is pretty simple - Snow White is sent as an ambassador to a powerful Sultan. Due to some cultural misunderstandings (not the least of which is the acceptability of sending a woman as an ambassador) and quite a few delays, Snow finally gets her chance to speak with the Sultan. He is, however, a man who has been betrayed by women before and so to protect himself from betrayal he marries a new woman each night and then has her killed before daybreak. Little does Snow know before she goes to him, her number is up. However, we know that Snow is quite a resourceful woman, and she begins telling him different stories and manages to catch his interest so that he wants her to keep coming back night after night. Really, this set up is pretty much only a frame for the real business which is the chance for readers to get to see the earlier stories of many of the Fables characters that we are now familiar with. 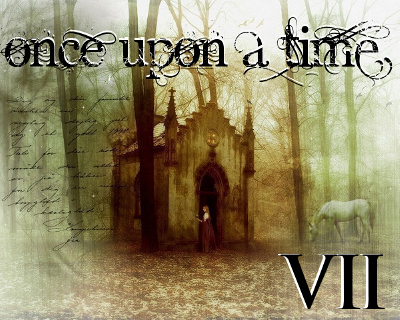 For example, the first and longest story in the book, is Snow White's own story - not so much the whole wicked queen and poison apple business - but what happened after she married her Prince Charming, with particular note on what happened with the dwarves after. These were definitely not your Disney style dwarves! (Sneezy, Dopey etc would have been safe in this telling. Can't say the same for these dwarves necessarily). One of the other stories that is told to the Sultan is that of the Frog Prince. A beautiful princess kisses a frog and a handsome prince appears. They are married and very happy together, raising a thriving family with many children. The fact that the prince reverts to his frog form on occasion is only a small problem, until his home is invaded and his wife and children are killed and he is unable to do anything to stop it. This was only a short story compared to some of the others, but it was quite graphic (as in sexually violent). And yet, it was also the story that gave me my biggest a-ha moment as it kind of explains why the character in the previous books in the series firstly likes to eat flies, and secondly is the way he is, which is that he kind of exists in a perpetual state of shell-shock. Another of the origins we got to explore was that of Bigby. Who would have thought he was the runt of the litter! We get to see how determined Bigby is, fighting his way up from awwww...Bigby as a cub to ewwww...Bigby as a malevolent killer. You can see much of these early lessons in the man who is one of my favourite Fables characters. We also got to find out about the witch and how she came to be in the new world, about how it was that Old King Cole became the mayor of Fabletown and why it became necessary to create the farm which is what started the tensions that led to him being ousted as mayor in the later books in the series. I think from a purely aesthetic perspective, the witch's story and how she came to meet Snow and Ruby Red was my favourite. While I enjoyed the stories, particularly the whole back to the beginning vibe, there were a couple of things that bothered me this time. Snow is telling the stories to the sultan with a view of keeping him from marrying her and then killing her before daybreak, and this apparently goes on for 1001 nights. That therefore means a different story every night and I think that this idea of different stories was part of the reason why each story had different illustrators. However, to me, the different stories didn't feel cohesive, because each of the stories felt really, really different from the others in terms of the artistic style, the dominant colour palettes etc. Now this happens to a degree with a normal Fables collection but usually there is one overarching story that is continuing the main Fables storyline, as well as a couple of other stories, with the main thread feeling pretty much cohesive from one edition to the next. The other thing that happened at the very end where Scheherazade is next to be in turn to go to the Sultan after Snow White has survived for 1001 nights, and Snow White tells her the secret of her survival - it kind of felt as though it was undercutting the whole Scheherazade story as an individual tale. On to the next Fables book then! Fables: 1001 Nights of Snowfall is set in the early days of Fabletown, long before the FABLES series began! Traveling to Arabia as an Ambassador from the exiled FABLES community, Snow White is captured by the local sultan who wants to marry her (and then kill her). But clever Snow attempts to charm the sultan instead by playing Scheherazade, telling him fantastic stories for a total of 1,001 nights, saving her very skin in the process. Running the gamut from unexpected horror to dark intrigue to mercurial coming-of-age, FABLES:1,001 NIGHTS OF SNOWFALL reveals the secret histories of familiar FABLES characters through a series of compelling and visually illustrative tales. Writer Bill Willingham is joined by an impressive array of artists from comic book industry legends to the amazing young painters of the next wave. FABLES:1,001 NIGHTS OF SNOWFALL is both a welcome entry point to the critically acclaimed series and an essential part of Willingham's enchanting and imaginative Fables mythos. Oh I just skimmed this because I haven't read it yet. (It'll be next after I finish the Jack books.) I did see that there were things that bothered you, but I didn't on to see what they were. Now I wonder what my reaction will be. Just a couple of things, but overall it was a good reading experience. Since my brother-in-law gave me this one for Christmas as a standalone, I didn't read this in the order Kelly said to read it in the series. However, I still enjoyed it. Unfortunately, I can't afford all of the others now, but maybe in June for my birthday. I am reading the whole series through the library. It's odd, I remembered several of these stories vividly, but hadn't remembered that they were all put together in this one collection! 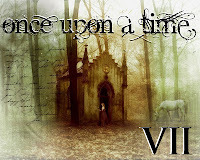 I love fairy-tale-character origin stories, and these were so interesting...although the Frog Prince's story was so painful and tragic! The Frog Prince's story will be the one that will stick with me the longest I think. I will certainly look at him differently next time I see him in one of the main Fables series book.